By: Dwight Smith, Nelson Mullins Riley & Scarborough LLP. Bank financing can take several forms, including commercial loans, repurchase agreements, and securities borrowing transactions, all of which are subject to regulation at the federal and state levels. This article provides an overview of the regulations and other supervisory policies that restrict and influence commercial lending by banks. 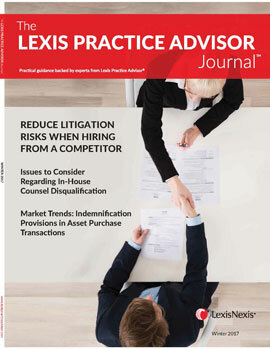 THIS DISCUSSION SHOULD BE OF USE TO PRACTITIONERS who advise on commercial lending, perform due diligence of commercial lending business, draft disclosure documents, or may represent banks in litigation or other adversarial proceedings. The scope of a banking organization’s commercial lending authority depends first on two factors: the charter of the lending entity and where in the organization this entity sits. The same loan may be subject to different requirements and limitations depending on these factors. To begin with, a banking organization is such because it includes a bank: an institution with a specific federal or state bank charter (and not a general state corporate charter) and with deposits insured by the Federal Deposit Insurance Corporation (FDIC). Several federal and state agencies offer charters to insured depository institutions. The term “bank” is used throughout to include all insured depository institutions, regardless of their charters. National bank and federal savings association charters are issued by the Office of the Comptroller of the Currency (OCC) under, respectively, the National Bank Act (NBA), 12 U.S.C.S. § 21, et seq., and the Home Owners’ Loan Act (HOLA), 12 U.S.C.S. § 1461 et seq. State bank charters are granted by a state banking agency. All 50 states, as well as the District of Columbia, Guam, Puerto Rico, and the U.S. Virgin Islands, provide such charters. Several (but not all) states offer other charters for institutions such as state savings associations, savings banks, and industrial banks. All state banks are regulated at the federal level as well as at the state level. Indeed, most state regulators will defer to federal regulators on examination and enforcement issues. A state bank (but not other state-chartered institutions) may choose to become a member of the Federal Reserve System. If it does so, the Federal Reserve Board (the Board) is its primary federal regulator; if not, then the FDIC is. Banks with different charters may be controlled by the same bank holding company, but this circumstance does not change the powers of any bank. Holding companies of banks or savings associations are organized as general corporations under state law and will be subject to any state laws, such as usury limits, that may apply to their loans. Bank holding companies are regulated both by the state in which they are organized and by the Board, although state regulation may be relatively light. The same holds true for savings and loan holding companies, although the regulatory framework at the federal level differs between bank holding companies and savings and loan holding companies. (Unless otherwise noted, the use of the term bank holding company includes a savings and loan holding company.) Other affiliates of a bank are subject to regulation by either the Board or the federal agency that oversees the bank. Banks may also establish their own subsidiaries under general state corporate law. A bank subsidiary generally may not engage in any activity beyond that permitted to its parent bank. These subsidiaries are regulated by the bank’s primary federal regulator. Banks have at least three competitive advantages over nonbank lenders. The first two constitute what the Board refers to as the federal safety net, since both are supported by the federal government. Banks may accept deposits, which are insured by the FDIC up to $250,000 per account. This insurance both reduces (and nearly eliminates) the possibility of runs on a bank and provides funding that is noticeably cheaper than that available to other lenders. In addition, a bank has access to financing through the discount window at the Federal Reserve Bank for the district in which the bank is located and through advances from Federal Home Loan Banks. This financing also is inexpensive and is less likely to be cut off if the bank comes under stress than funding from other sources. Because discount window loans are available when other funding sources are not, there is some stigma associated with borrowing from the discount window, and many banks will try to avoid doing so. The third advantage that banks have over non-bank lenders is the preemption of state usury laws outside of the state in which the bank is located and conducting its lending. A bank must adhere to the interest rate ceilings, if any, imposed by the law of its location state, and such restrictions apply to loans in any other jurisdiction, even if in conflict with that other jurisdiction’s own limitations. The regulation and supervision of lending on an institutionspecific basis can take different forms. Every bank and bank holding company is examined every 12 to 18 months. Examinations include an on-site review of the institution’s commercial loan portfolio or a sample thereof. A bank examination will result in a score of one to five on each of six areas of a bank’s operations—capital, asset quality, management, earnings, liquidity, and sensitivity to market risk (known by the acronym CAMELS)—as well as a composite CAMELS rating. A holding company examination involves a different scoring methodology but in substance is similar to a bank examination. Notably, the ratings and the accompanying examination report are highly confidential and not available to the public. If performance or compliance problems surface in the commercial loan portfolio, the asset quality score is likely to be downgraded. Scores for management and earnings also may be affected adversely. Problems may also result in enforcement actions, which may be formal or informal. Modest regulatory concerns for which corrective action is readily available are often covered in informal, nonpublic memoranda of understanding. More significant issues will be the subject of a public written agreement or consent order. A bank may challenge examination findings through an appeal to the ombudsman in the agency that regulates it. A bank may also contest a proposed enforcement action through a public trial-type hearing; such proceedings rarely occur since the reputation risk is high. For a state bank or a state savings association, the language of the pertinent statute varies, although many states use language substantially similar to the National Bank Act. Indeed, Section 96 of the New York Banking Law was a model for Section 24 (Seventh). While the basic lending authority for a bank is largely open-ended, regardless of jurisdiction, significant limits on loan concentrations and on loans to insiders and affiliates apply and may vary by bank charter. A bank holding company and its direct and indirect subsidiaries (other than a subsidiary bank) have the authority to engage in financing activities through their general corporate powers, but subject to Section 4 of the Bank Holding Company Act and the Board’s implementation of the statute through Regulation Y, 12 C.F.R. pt. 225, and several interpretations. Section 4 allows a bank holding company to engage in activities "so closely related to banking as to be a proper incident thereto." 12 U.S.C.S. § 1843(c)(8). As implemented in Regulation Y, this provision includes the "making, acquiring, brokering, or servicing loans or other extensions of credit (including factoring, issuing letters of credit and accepting drafts)." 12 C.F.R. pt. 225.28(b)(1). A bank holding company may also engage in activities that are “usual in connection with” lending, such as appraising real and personal property, arranging commercial real estate equity financing, offering check-guarantee servicing, acting as a collection agency, operating a credit bureau, real estate settlement servicing, and acquiring debt or default. A savings and loan holding company has the same authority under Section 10(a)(2) of the Home Owners Loan Act and the Board’s Regulation LL, 12 C.F.R.pt. 238.54. While the lending authority of a bank and its holding company is nearly equal, a banking organization will typically maximize its lending at the bank level rather than at the holding company level because only a bank may rely on the least expensive source of funding: deposits insured by the FDIC. Virtually any effort by a bank to transfer this funding advantage elsewhere in the organization is severely limited, if not prohibited. Accordingly, the role of a bank holding company (or other bank affiliate) is to step in where a bank cannot. For example, a bank may extend credit to insiders only on a strictly limited basis, under a set of rules known as Regulation O, 12 C.F.R. pt.215. These restrictions do not apply to loans by a bank holding company. Other concentration restrictions are limited to banks as well, although the Board has discretionary authority to limit holding company lending on an ad hoc basis. A bank or a bank holding company may extend both secured and unsecured credit. Viewed through the regulatory prism, collateral or some other form of credit enhancement is desirable because it may reduce the capital charge on the loan. For commercial credit, a wide variety of collateral is available. Loans to a company for general operating expenses or corporate purposes may be unsecured, although a bank will often seek a guarantee. The financing of any line of business is often collateralized by the receivables resulting from the business. A bank may also factor receivables. Commercial real estate loans are complex from a regulatory perspective. These loans are secured by the underlying real property but, to avoid substantial capital charges and particular regulatory scrutiny, must be over-collateralized by 25%–50%, and a developer typically must make an equity contribution equal to at least 15% of the value of the project. Changes in the market value of the property and the status of the development may require adjustments to the nature and amount of capital. Certain limits apply to the types of collateral that a bank may take. For example, the restrictions on affiliate transactions strongly deter a bank from taking the stock of its holding company as collateral. Loans by federal and state savings associations are subject to additional restrictions, explained in more detail below. These depository institutions—popularly known as thrifts—originally focused on retail mortgage lending. Their holding companies were allowed to engage in an open-ended range of both commercial and financial activities well beyond those available to bank holding companies, so long as each controlled only one savings association and that association complied with the qualified thrift lender (QTL) test. 12 U.S.C.S. § 1467a(m). The advantages of a savings and loan holding company with respect to its activities have largely disappeared, but the QTL test remains. In broad terms, this test requires a savings association to hold at least 65% of its assets in residential mortgage loans or other mortgage-related assets. In addition, specific, quantitative ceilings apply to various kinds of commercial loans and a few consumer loans. The principles of prudent underwriting of commercial loans are almost intuitive for most bankers. The bank regulatory agencies have largely avoided specific or quantifiable industry-wide requirements beyond those set forth the statutes. Each of the agencies describes prudent practices in the manuals that guide each agency’s examiners. Three briefer interagency statements lay the groundwork for the regulators’ view of safe and sound lending: the Interagency Guidelines Establishing Standards for Safety and Soundness, 60 Fed. Reg. 35674; Interagency Guidelines for Real Estate Lending Policies, 12 C.F.R. pt.208 app. C; and the Interagency Supervisory Guidance Addressing Certain Issues Related to Troubled Debt Restructurings, 2013 FDIC Interp. Ltr. LEXIS 47. Where the regulators have found defective underwriting, the remedial enforcement orders contain fairly standard statements of what the regulators believe constitutes prudent underwriting. Each of the interagency issuances is discussed below. The Safety and Soundness Guidelines also require that, as a bank’s loan portfolio grows, the growth be prudential. The bank is expected to consider the source, volatility, and use of the funds that support asset growth; any increase in credit risk or interest rate risk as a result of growth; and the effect of growth on the institution’s capital. The regulatory capital rules also affect the underwriting of commercial real estate loans. The Interagency Supervisory Guidance Addressing Certain Issues Related to Troubled Debt Restructurings addresses a bank’s efforts to deal with borrowers in default or approaching default. If a commercial borrower misses a payment, or is even in danger of missing a payment, the lending bank may decide that restructuring the debt into one that will perform—typically a loss-generating exercise—will enable the bank to capture more of the value of a loan than through foreclosure. In addition to these formal guidelines, the federal bank regulators have emphasized in enforcement actions and speeches in recent years the importance of robust risk management and the ability of a bank to control operational risk. This focus means that a bank’s board of directors has a role in the lending business. A lawyer counseling a bank board should be aware that the board or an appropriate board committee must approve high-level policies on lending and must receive and review periodic reports on the bank’s lending business. A lawyer conducting due diligence of a bank should review the sufficiency of the lending policies and, depending on the significance of the commercial lending function to the bank’s overall business, the adequacy of the periodic reports. Over time, changes in economic conditions and in the bank regulatory framework will induce changes in bank lending practices and attract the attention of the bank regulators. Most recently, banks have increased their financing of the growing shadow banking sector—lenders that make bank-like loans but that do not have bank charters and are not subject to safety and soundness regulation. Indeed, these nonbanks rely to a material degree on bank loans. Since a bank could make the same types of loans to the same borrowers, lending to another lender has raised agency concerns about the bank’s understanding and management of credit risk and the bank’s ability to ensure that loans to the ultimate borrowers comply with consumer protection and Bank Secrecy Act regulations. Dwight Smith is a partner of Nelson Mullins Riley & Scarborough LLP in Washington, D.C.